Type your own words or choose a list. Suitable for: Grades 1 up to 6. A wonderful website to suit all your spelling needs! You can either type your own words to practice, or choose a list from a huge assortment of spelling lists. The lists are organized by themes and by grades, so you can easily find one that suits your needs. As you type each word, you will immediately hear its pronunciation. This way you can also learn how to pronounce each word correctly. Suitable for: 2nd and 3rd graders. Start the game by choosing the phonemes to practice. In this game a word will be vocally said (listen carefully!) accompanied by a written word fragment. 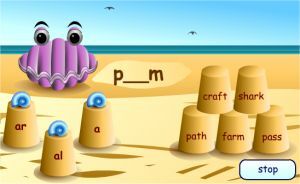 Click the sandpie with the phoneme that completes correctly the word fragment. With every correct click a part of the sand castle will be built. When you complete successfully the sand castle, choose other phonemes to practice. Start by choosing the difficulty level (easy or hard). In every trial four words will be displayed. One word will be spelled wrong. Locate that word, and put a checkmark next to it. Then, spell that word correctly inside the text box, and click the "Check it!" button to get feedback and proceed to the next trial with four new words. If you checked the wrong word, it will tell you to try again. If you checked the correct word but didn't spell it correctly, it will show you the right way to do it and you will proceed on to the next trial. Suitable for: 3rd and 4th graders. This is a fast paced underwater racing game. Start by choosing your animal to race with. An incomplete word will appear in the box on the top left corner. 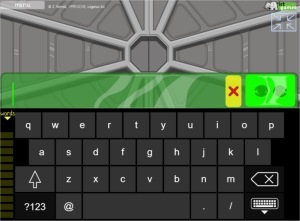 Type the missing letter in the box under it, and hit the "Enter" key. Every correct answer will drive your animal forward closer to the finish line. Every wrong answer will boost ahead your opponents. If you succeed to reach the finish line first, you will advance to the next level, which presents harder words. Suitable for: Kids in kindergarten and 1st grade. This is an amusing game, in the theme of "Clifford the big red dog" kids cartoon. In the easy level, the letters to spell are dimly shown, and your job is to cover them by dragging letters from below. In the harder level, you have to listen carefully to what the girl is saying, and complete the missing letters in the empty word by dragging them from below. You can have the girl repeat her sentence by clicking her. The game is very user friendly, it won't enable you to place a letter in the wrong placeholder. Also you can always click the "Next" arrow and get a new word to spell. Suitable for: All grades (1 up to 8). On entering the game you can choose the list of words to practice. You can use the proposed list, or edit it, or get more proposed lists by trying the various buttons on the bottom. Then click the "Go" button. Have a close look at the word given. Then, click the "Cover" button. A hand will come into the screen and cover the word. Now, Type the word in the white text box, and click the "Check" button. If you are correct, you will proceed to the next word. Otherwise, you will be shown the same word again and get another chance. 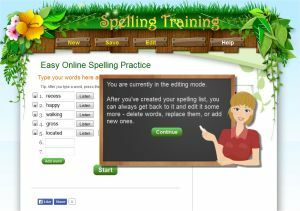 On this page you will find several games that help students practice their spelling skills. The exercises run from kindergarten all the way up to eighth grade, for the Spelling Bee game. Many of these are hearing-based - the program reads the word to the student, who listens to the sounds and types out the letters they hear. 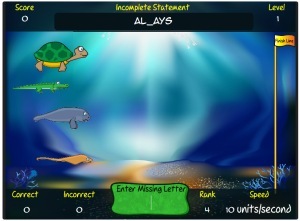 The games intended for younger children (pre-school and 1st grade), such as Dog’s Letter Pit, may skip the typing entirely and have students drag the letters that they hear. These activities are fun and effective additions to any language arts curriculum. 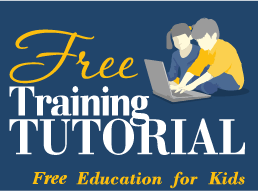 The wide variety of online spelling activities presented here promises an appropriately challenging exercise for students of 2nd and 3rd grade, at any level of skill!